And taste nothing like those soggy tubular ones you know so well. You’ve probably eaten hearts of palm. But...have you really eaten hearts of palm? The vegetable, as most in the U.S. know it, comes in a can, or a jar — pickled in oil or brine until extra-shiny and gelatinous. It appears atop salads, mostly as thinly sliced wheels mixed with lettuce, sliced hard-boiled eggs, maybe with some onions and a lemon vinaigrette. But at Puna Gardens in Kurtistown, Hawaii, hearts of palm are a different matter entirely. For over a decade, the farm and its owners, Rick Worley and Mary Ryan, have been growing and harvesting 18,000 acres of hearts of palm and shipping them — completely fresh — to chefs across the country. As a result, they’re changing the way diners appreciate the sleek, white vegetable. A heart of palm is the core part of the stem of certain varieties of palm tree (in the case of Puna Gardens, the peach palm, originally from Brazil). It is smooth and soft with a pleasant crunch, and can take on the flavor of practically any seasoning it’s paired with — both brilliant qualities that are, for the most part, lost when the vegetable is pickled. In the United States, Hawaii is the only place where hearts of palm grow, as the state’s semi-tropical, rainy climate allows the vegetable to thrive. Growing conditions are even better in Kurtistown, whose strategic location on the slope of the Mauna Loa volcano places it right below the rain belt and right above the sun belt—code for botanical perfection. The weather, coupled with the rocky volcanic soil, produces hearts of palm with a snappy chew and an innate, easy-to-eat softness, and a mild flavor that’s sweet, tropical, and oceanic all at the same time. In much of Central America, where hearts of palm are grown for commercial purposes, the vegetable is cut when the tree is barely a few feet tall, yielding tiny, flavorless morsels. At Puna Gardens, according to Worley, the palm trees grow quickly and industriously, yielding large (sometimes 12-pound! ), meaty hearts of palm that perfectly straddle suppleness and crunchiness. “They can literally be put in anything,” Worley claims. He slices them up for scrambled eggs, throws them on pizza, mixes them into spaghetti sauce, and throws them into stews for unique texture. 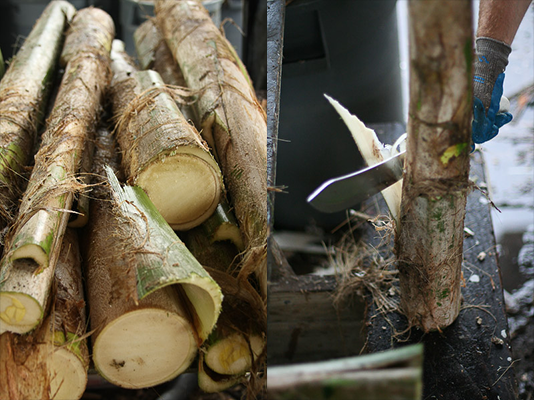 Puna’s palms are harvested every Sunday and shipped on Monday, arriving to customers by Wednesday at the latest. When Worley and Ryan were first starting out, Worley would look on OpenTable “for restaurants that had 5 dollar signs by the name” and call up the chefs, offering to send them product. It worked. “Finally, I had to stop calling, because we had so many repeat customers," he says. He hasn't had to market his product in four or five years. Photos courtesy of Puna Gardens. Johnny Clark and Beverly Clark Kim, co-chefs and co-owners of Chicago’s Parachute are two such loyal customers. Avid hearts of palm fans, they found Puna Gardens through a random Google search for purveyors. “It was a mom and pop shop with an affordable, fresh product, so we gave it a try,” says Clark. Before Puna Gardens, Clark had never tasted hearts of palm fresh. “Sometimes when you order from someone who is stocking them in a giant warehouse, they tend to get yellow after only a few days," he says. The flavor was unlike any other version of the vegetable they had ever tried. “It almost tasted like a coconut,” he explains. “It was sweet, it was nutty, it was refreshing in a way.” The texture evoked a strange hybrid of “an apple married with an avocado" with a crunchy creaminess. With a steadily climbing customer base and a business now exclusively focused on hearts of palm (they used to grow tropical flowers as well), Worley and Ryan plan to expand their land by at least 20 more acres in the next few years. 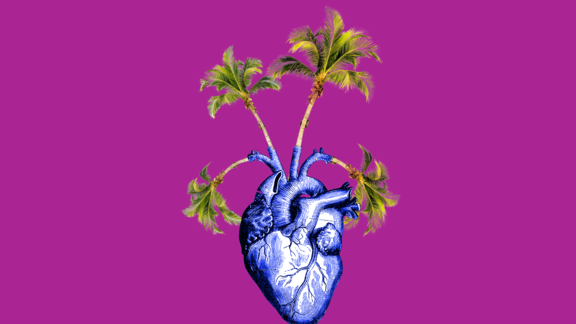 Because many varieties of hearts of palms are on the endangered species list, they can no longer import the seeds from out of the country, so they’ve begun to grow their own. They’re hopeful fresh hearts of palm like the ones they cultivate will eventually make their way into home kitchens, and displace the slimy pickled ones that come in cans and jars. Asin Tibuok is one of the rarest ingredients in the world—produced by just one family on a small island in the Philippines. You should probably order that thing you keep seeing on menus everywhere.